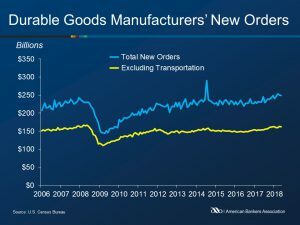 New orders for manufactured durable goods decreased 0.6 percent in May to $248.8 billion, following a 1.0 percent April decline, according to the U.S. Census Bureau. The volatile transportation equipment sector led the decline, falling 1.0 percent to $86.1 billion over the month. Motor vehicles and parts were the largest contributor to transportation’s decline, decreasing 4.2 percent to $55.6 billion. New orders excluding the transportation sector fell 0.3 percent. New orders excluding defense declined 1.5 percent on the month, while orders of nondefense capital goods slid 2.0 percent to $77.1 billion. Shipments of manufactured durable goods fell 0.1 percent to $246.9 billion. Inventories of manufactured durable goods continued to rise, growing 0.3 percent to $403.0 billion. This followed a 0.3 percent April increase and led to growth in twenty-two of the last twenty-three months.